Join the JEACs – the Patels: Rohan, Nimal, Anu, Gina and, of course, their dog Hunter; the Larkins: Amy and Mich; Umedh Ghosh, Rohan's best friend; and Jason, Corazon, Chris and Ricky - four Canadians. More and more JEACs - Hurray! O Canada! Rohan, Umedh, Amy, Nimal, Anu, Gina and Mich are overjoyed to be together at Manipau Wildlife Conservation Centre (MWCC), located in the lower Rocky mountains in western Canada, and home to Amy and Mich Larkin. They are delighted that land directly east of the Manipau border is under construction to build an entire Conservation Community for senior citizens. This community will become involved, through Manipau, in educating family and friends about the importance of protecting animals and the environment. Driving home from the Calgary airport, Janet Larkin, Mich and Amy's mom, receives a call - a female grizzly bear is seriously injured and her cubs are distraught. Janet, who had not wanted to spoil the JEACs' reunion, reluctantly informs them of a recent problem with missing grizzlies at their Centre. Upon reaching the Centre, Nimal soothes the mother bear, and to the delight of the others, undertakes to look after the cubs. redictably, the JEACs, and four new Canadian friends, Jason, Corazon, Chris and Ricky, are determined to discover why grizzlies are being decimated, and by whom - this simply cannot be allowed! They camp out at GW - Grizzly Watch, and begin their investigations, joined by Corazon - the daughter of one of the rangers, Chris - Mich and Amy's cousin, and Ricky - Chris' friend. Jason, a young construction worker on the Conservation Community construction site also joins them. Who is killing the grizzly bears? How do they gain access to Manipau? How many crooks are there? The JEACs use their innumerable talents to resolve the situation. 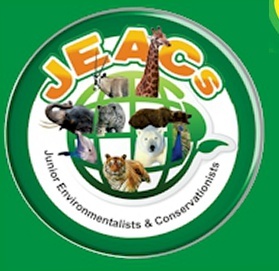 Read the story about the JEACs' fifth adventure, and meet even more new members! There are LOTS of extras in this book: DR. DOUG WHITESIDE'S wonderful Foreword! What an amazing zoo veterinarian he is! Also, did you know that there are real JEACs in Calgary? The leaders of the JEACs - CAC - No.3 group and their mothers, have written articles in this book. 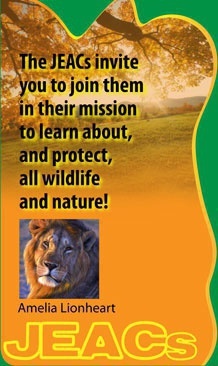 Did you know that together with Amelia Lionheart (the author of these books), this group raised over $6,000/- in two years, and donated money to many organizations. Further, many young people, and some adults, have also written short letters, which are also compiled at the end of this book. Finally, don't forget that everybody has at least one talent! And, here's a reminder that YOU are unique! Please use your talents and encourage your family and friends to develop their talents too! You can also read, online, extracts from a few chapters. in their fifth exciting adventure!